Beyond the Taproom: Is This the Bridge Between a Small Start-Up and Full-Scale Distribution? Bump was talking about well-established brands too, if he’s right, then that means it’ll be increasingly difficult for a new brewer with no track record to get on the shelves. LIBDIB IS HERE TO TRY AND FIX THAT. Cheryl Durzy, founder of Liberation Distribution aka LibDib, is on a mission to ensure that’s not the case. She created three-tier compliant tech company to help the give the little bev alc producers a route to market, by playing matchmaker between suppliers and retailers [see BBD 08-11-2017]. 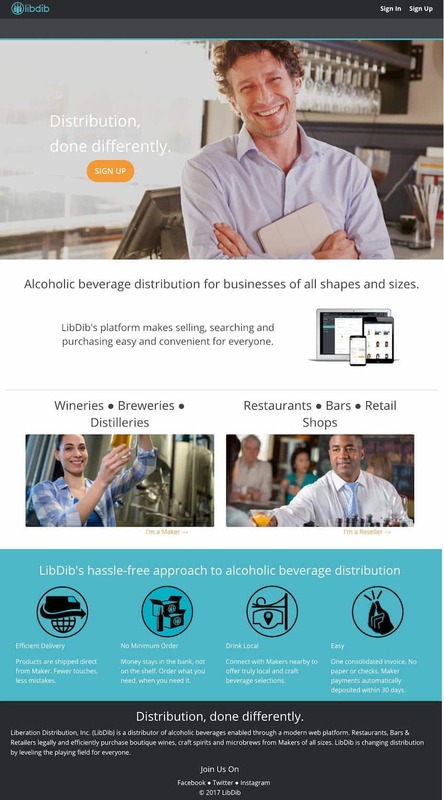 To be clear, LibDib is a licensed distributor, but not necessarily competing with established distributors. They’re taking on brands that are perhaps too small for traditional distributors to consider, and bridging the gap until they’re ready for conventional distribution. It’s been exactly one year since LibDib launched, so CBD caught up with Cheryl to hear how year one went and what they have in store for the years ahead. When it comes to the beer side of things, Cheryl said they’ve learned a lot in year one. Beer is “challenging,” she said. They’ve had to build “a lot of super proprietary” stuff to manage things like keg returns, price posting in individual counties. It took some time to build those out, Cheryl said, but they’re working now and it’s awesome. PLANS TO OPEN 10 STATES THIS YEAR. The platform is still only available in the two states noted above (CA, NY), but Cheryl said the plan is to “open at least 10 states this year.” Her ultimate goal is to be in every state. SHOOTING FOR ALL 50. If she can reach that goal, “I think that’s really when I feel like okay, we’ve evolved, we’ve evolved the three-tier system,” she said. “It means that everybody, any supplier has access to every market.” Indeed, she envisions a future where nearly anything is possible for the suppliers: if a maker wants to send 50 cases just for a festival, or a keg for a friend’s wedding, across the country, then they can make that happen. TEAMING UP WITH DISTRIBS. Cheryl said she’ll have to forge partnerships with other distributors to get to all 50 states, cause a lot of them hold the At Rest Law, which means it has to bump the dock at a licensed distributor to get delivered, and subsequently throws a wrench into LibDib’s model. Though Cheryl said she’s been talking to wholesalers that are interested in leasing some of their spaces in the warehouse and providing transportation. “They have these big warehouses with space, and they have trucks that have space. I’m like, ‘I’ll pay you for your trucks, I’ll pay you for your space in your warehouse. If we can get the product to your warehouse, can you deliver it that last mile?’ They’re really good at that,” she said. One such person is Scott Novosel, founder of O Light Beer “the first and only certified organic light beer on the market,” who tells CBD that LibDib helped make his 10-year dream become a reality. ORIGIN OF O LIGHT. Scott, a former personal trainer, hatched an idea to bring an organic light beer to the market, after failing to find one that he could recommend to his clients. He hired a brewmaster to help him formulate the recipe back in 2013, then went on a search to find a contract brewery that could brew it organically. He found his match with Hermitage Brewing Company in San Jose, California and the first O Light beer was canned last September. NEXT STEP… GETTING IT TO MARKET. Once he had his product in hand, Scott said he didn’t really bother calling up a distributor, because the brand didn’t have a proven track record, and presumed no one would take it in. He figured self-distribution was his best bet, “let’s just start small, let’s just self-distribute here in Northern California and go from there,” he said. But before he could ensue that endeavor an industry friend hooked him up with Cheryl and he got on board the LibDib platform. NOW AT 143 RETAIL LOCATIONS. O Light made it into the LibDib system at the end of last year, and it’s now in 143 retail locations, and he’s hoping he can triple that number by the end of summer. For now, the locations where O Light is popping up are a mix of some “healthy grocery stores” across the state, some “major chains,” and some small and large restaurants, Scott said. O Light comes in one SKU, four-packs of 16-oz. cans. “It’s funny because every store I call they’re like, you got any other SKUs, and I’m like no man, I’m just a one-SKU dude,” Scott said. [Ed. Note: I dig that]. The four packs retail anywhere from $9.99 to $13.50 basically, depending on the store. Not even a little concern, like maybe with the world’s largest brewer rolling out an “organic” beer with Michelob Ultra Pure Gold? Nope. “I hope everybody else starts falling in line,” Scott said. “Environmentally it’s going to help people, health wise it’s going to help people. “For me it’s like, man they’re putting all the advertising that I could never pay for, like they’re bringing an awareness of why there should be an organic beer. So to me it’s like, it couldn’t be any better timing. So dude, this brings an awareness, and I love it man! I’m so excited about it. Happy Birthday to LibDib!More, More MORE!